This example shows how to improve the performance of an engine cooling fan through a Design for Six Sigma approach using Define, Measure, Analyze, Improve, and Control (DMAIC). The initial fan does not circulate enough air through the radiator to keep the engine cool during difficult conditions. First the example shows how to design an experiment to investigate the effect of three performance factors: fan distance from the radiator, blade-tip clearance, and blade pitch angle. It then shows how to estimate optimum values for each factor, resulting in a design that produces airflows beyond the goal of 875 ft3 per minute using test data. Finally it shows how to use simulations to verify that the new design produces airflow according to the specifications in more than 99.999% of the fans manufactured. 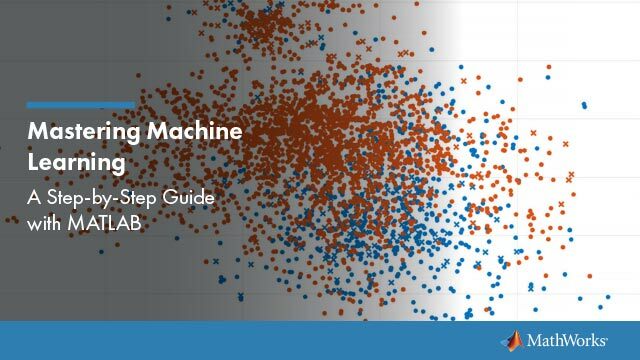 This example uses MATLAB®, Statistics and Machine Learning Toolbox™, and Optimization Toolbox™. This example addresses an engine cooling fan design that is unable to pull enough air through the radiator to keep the engine cool during difficult conditions, such as stop-and-go traffic or hot weather). Suppose you estimate that you need airflow of at least 875 ft3/min to keep the engine cool during difficult conditions. You need to evaluate the current design and develop an alternative design that can achieve the target airflow. 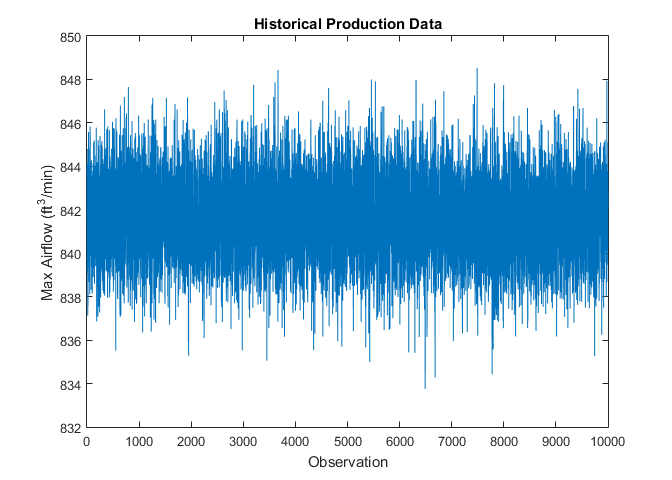 The data consists of 10,000 measurements (historical production data) of the existing cooling fan performance. Plot the data to analyze the current fan's performance. The data is centered around 842 ft3/min and most values fall within the range of about 8 ft3/min. The plot does not tell much about the underlying distribution of data, however. Plot the histogram and fit a normal distribution to the data. fitdist fits a normal distribution to data and estimates the parameters from data. The estimate for the mean airflow speed is 841.652 ft3/min, and the 95% confidence interval for the mean airflow speed is (841.616, 841.689). This estimate makes it clear that the current fan is not close to the required 875 ft3/min. There is need to improve the fan design to achieve the target airflow. In general, fluid systems have nonlinear behavior. Therefore, use a response surface design to estimate any nonlinear interactions among the factors. Generate the experimental runs for a Box-Behnken design in coded (normalized) variables [-1, 0, +1]. The first column is for the distance from radiator, the second column is for the pitch angle, and the third column is for the blade tip clearance. Suppose you want to test the effects of the variables at the following minimum and maximum values. Randomize the order of the runs, convert the coded design values to real-world units, and perform the experiment in the order specified. Suppose that at the end of the experiments, you collect the following response values in the variable TestResult. Display the design values and the response. Save the design values and the response in a table. D stands for Distance, P stands for Pitch, and C stands for Clearance. Based on the experimental test results, the airflow rate is sensitive to the changing factors values. Also, four experimental runs meet or exceed the target airflow rate of 875 ft3/min (runs 2, 4,12, and 14). However, it is not clear which, if any, of these runs is the optimal one. In addition, it is not obvious how robust the design is to variation in the factors. Create a model based on the current experimental data and use the model to estimate the optimal factor settings. where AF is the airflow rate and Bi is the coefficient for the term i. 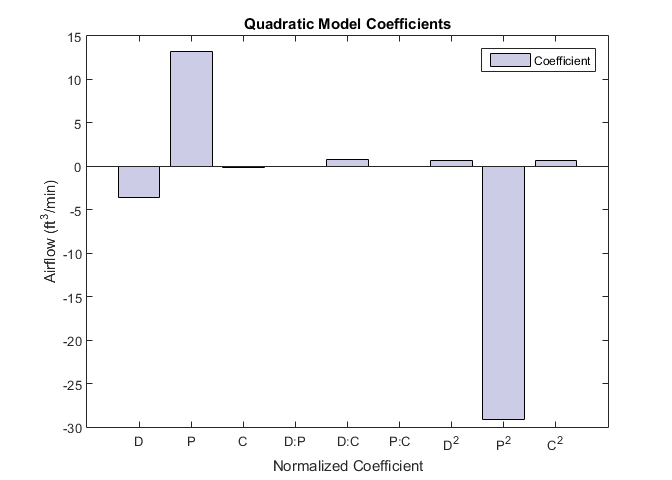 Estimate the coefficients of this model using the fitlm function from Statistics and Machine Learning Toolbox. Display the magnitudes of the coefficients (for normalized values) in a bar chart. The bar chart shows that Pitch and Pitch2 are dominant factors. You can look at the relationship between multiple input variables and one output variable by generating a response surface plot. Use plotSlice to generate response surface plots for the model mdl interactively. The plot shows the nonlinear relationship of airflow with pitch. Move the blue dashed lines around and see the effect the different factors have on airflow. Although you can use plotSlice to determine the optimum factor settings, you can also use Optimization Toolbox to automate the task. Find the optimal factor settings using the constrained optimization function fmincon. The objective function is a quadratic response surface fit to the data. Minimizing the negative airflow using fmincon is the same as maximizing the original objective function. The constraints are the upper and lower limits tested (in coded values). Set the initial starting point to be the center of the design of the experimental test matrix. Convert the results to a maximization problem and real-world units. The optimization result suggests placing the new fan one inch from the radiator, with a one-inch clearance between the tips of the fan blades and the shroud. Because pitch angle has such a significant effect on airflow, perform additional analysis to verify that a 27.3 degree pitch angle is optimal. 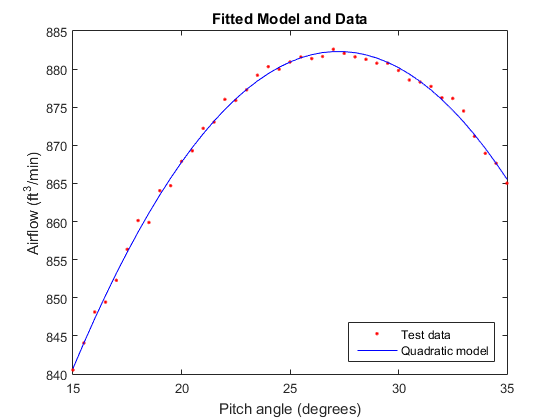 The results show that a quadratic model explains the effect of pitch on the airflow well. Plot the pitch angle against airflow and impose the fitted model. Find the pitch value that corresponds to the maximum airflow. The additional analysis confirms that a 27.3 degree pitch angle is optimal. The improved cooling fan design meets the airflow requirements. You also have a model that approximates the fan performance well based on the factors you can modify in the design. Ensure that the fan performance is robust to variability in manufacturing and installation by performing a sensitivity analysis. Suppose that, based on historical experience, the manufacturing uncertainty is as follows. Verify that these variations in factors will enable to maintain a robust design around the target airflow. The philosophy of Six Sigma targets a defect rate of no more than 3.4 per 1,000,000 fans. That is, the fans must hit the 875 ft3/min target 99.999% of the time. You can verify the design using Monte Carlo simulation. Generate 10,000 random numbers for three factors with the specified tolerance. First, set the state of the random number generators so results are consistent across different runs. Perform the Monte Carlo simulation. Include a noise variable that is proportional to the noise in the fitted model, mdl (that is, the RMS error of the model). Because the model coefficients are in coded variables, you must generate dist, pitch, and clearance using the coded definition. Calculate airflow for 10,000 random factor combinations using the model. Add noise to the model (the variation in the data that the model did not account for). 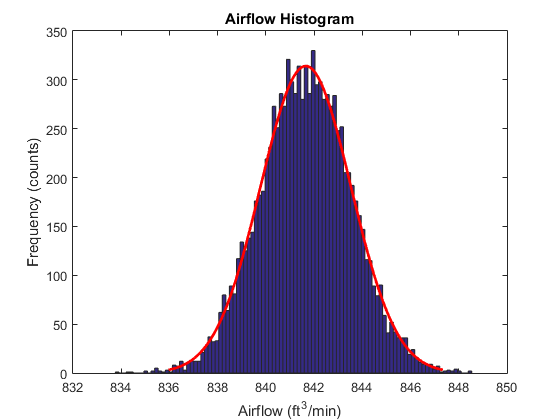 Evaluate the variation in the model's predicted airflow using a histogram. To estimate the mean and standard deviation, fit a normal distribution to data. The results look promising. The average airflow is 882 ft3/min and appears to be better than 875 ft3/min for most of the data. 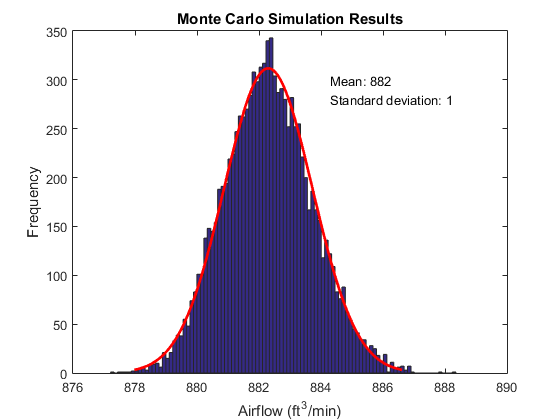 Determine the probability that the airflow is at 875 ft3/min or below. The design appears to achieve at least 875 ft3/min of airflow 99.999% of the time. Use the simulation results to estimate the process capability. The Cp value is 1.75. A process is considered high quality when Cp is greater than or equal to 1.6. The Cpk is similar to the Cp value, which indicates that the process is centered. Now implement this design. Monitor it to verify the design process and to ensure that the cooling fan delivers high-quality performance. You can monitor and evaluate the manufacturing and installation process of the new fan using control charts. Evaluate the first 30 days of production of the new cooling fan. Initially, five cooling fans per day were produced. First, load the sample data from the new process. Plot the X-bar and S charts. 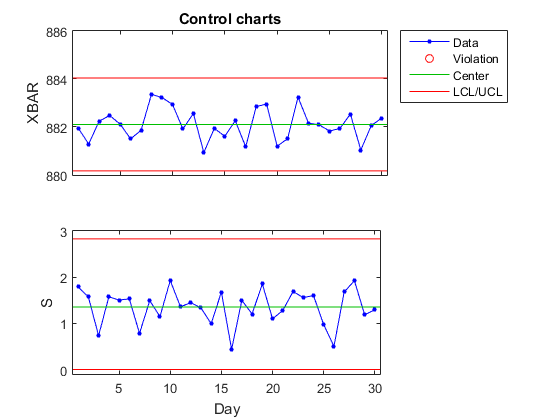 According to the results, the manufacturing process is in statistical control, as indicated by the absence of violations of control limits or nonrandom patterns in the data over time. You can also run a capability analysis on the data to evaluate the process. The Cp value of 1.755 is very similar to the estimated value of 1.73. The Cpk value of 1.66 is smaller than the Cp value. However, only a Cpk value less than 1.33, which indicates that the process shifted significantly toward one of the process limits, is a concern. The process is well within the limits and it achieves the target airflow (875 ft3/min) more than 99.999% of the time.